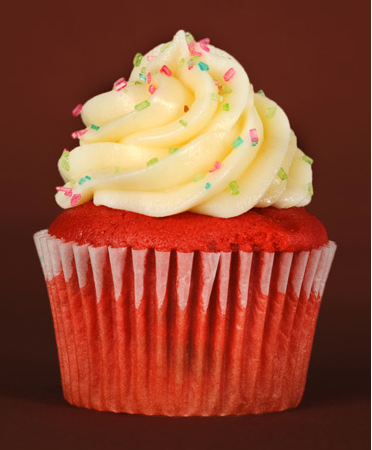 "It seems people can't resist the red velvet cupcakes' deep red crumb with white Cream Cheese Frosting. Mix all the ingredients well so that the sponge has an even color and texture. For added color contrast, you can sprinkle some extra red velvet crumbs over the frosted cupcakes." I won't even begin to describe how much I LOVE red velvet -- just know that I friggin' lovvee it. LOVE IT. Interestingly enough, the first time I heard of the flavor coincided with my first visit to Portland's Saint Cupcake Bakery during my sophomore year of college. Staring at the bright red cake, I asked the woman behind the counter what it was. To be fair, I think her description of "chocolate and vanilla cake mixed together" is not necessarily an accurate one. But as I was writing this, I realized that I was stumped myself -- how would you actually describe red velvet cake? Hm. So what exactly differentiates it from vanilla and chocolate cupcakes? A cursory look at the ingredients list reveals: (1) the use of buttermilk instead of regular whole milk, and (2) the use of baking soda and vinegar as a chemical leavening agent as opposed to baking powder. Put the butter and the sugar in a freestanding electric mixer with a paddle attachment (or use a handheld electric whisk) and beat on medium speed until light and fluffy and well mixed (approximately 5 minutes). When everything is well mixed, turn the mixer up to high speed and slowly add the egg. Beat until everything is well incorporated. In a separate bowl, mix together the cocoa, red food coloring, and vanilla to make a thick, dark paste. Add to the butter mixture and mix thoroughly until evenly combined and colored, scraping any unmixed ingredients from the side of the bowl with a rubber spatula. Turn the mixer down to slow speed and slowly pour in half the buttermilk. Beat until well mixed, but be careful not to overmix. Add half the flour and beat until everything is well incorporated. Repeat this process until all the buttermilk and flour have been added, making sure to scrape down the sides of the bowl. When all the buttermilk and flour have been added, turn the mixer up to high speed and beat until you have a smooth, even batter. Turn the mixer down to a lower speed and add the salt, baking soda, and vinegar. Beat until well mixed, then turn up the speed again and beat for a couple more minutes. Spoon the batter into cupcake cases until two-thirds full and bake in the preheated oven for 20-25 minutes. 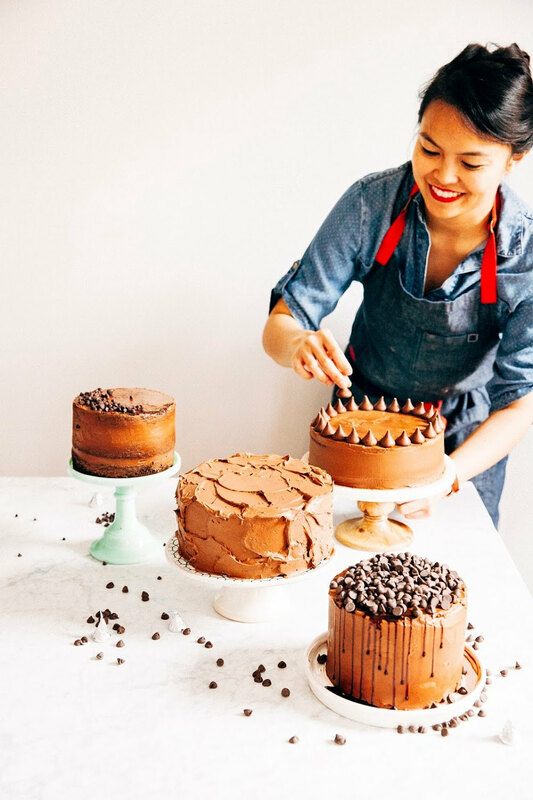 When ready, the cake tops should bounce back when touched and a toothpick inserted in the center of the cake should come out clean. Let the cupcakes cool slightly in the pan before turning out onto a wire rack to cool completely. 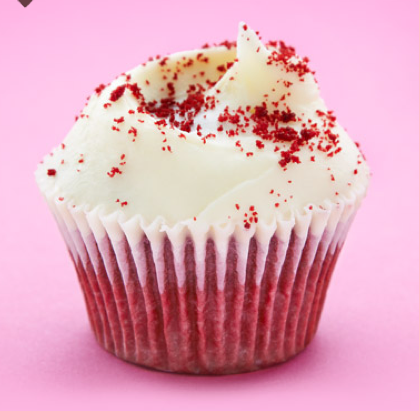 The red velvet recipe differs slightly from the vanilla/chocolate cupcakes in that it adds the flour into the liquid sugar/butter/egg mixture as opposed to the vanilla chocolate cupcakes, where liquid (whole milk) is added into the flour mixture. Maybe that makes a difference in taste or affects the structure somehow, thus earning the 'velvet' title to describe its texture? Eitherway, my boyfriend Erlend described the cake as a "very mild chocolate cake with cream cheese frosting." Kiron, a good friend, supplied another answer: "Red sponge cake with a hint of chocolate. Most of the flavor comes from the icing." That seems a little bit more accurate. Though I would never have thought of calling red velvet as a "sponge" cake -- this appears to be a British term. 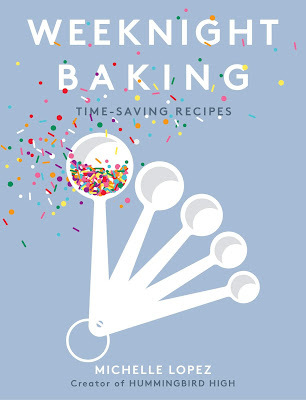 Hummingbird Bakery's cookbook and website also toss the term "sponge" around a lot. But it's interesting that both Erlend and Kiron mentioned frosting in their descriptions. It really does seem as if the cake's cream cheese frosting lends a lot of flavor to the cake itself. This weekend, for instance, I whipped up a batch of red velvet cupcakes for my co-worker's SuperBowl party. Because I forgot to buy cream cheese, I substituted the regular cream cheese frosting for Hummingbird Bakery vanilla frosting. To my surprise, the cake was distinctly different. Not bad -- just different. It tasted like I was eating a Hummingbird Bakery vanilla cupcake as opposed to a red velvet one. Hm. Which reminds me -- yes, you did read that right. 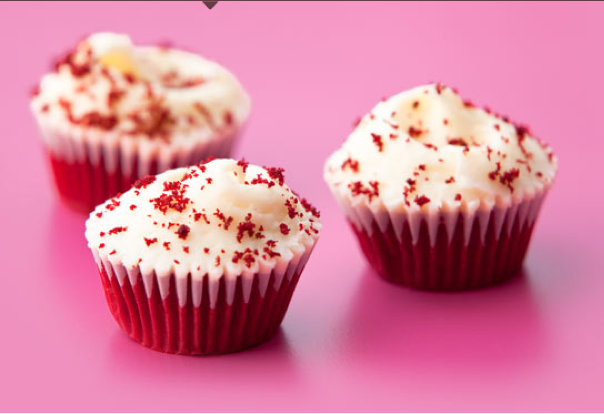 I did make Hummingbird Bakery red velvet cupcakes this weekend. Using the unaltered, sea-level recipe I listed above. So how did those turn out? They turned out quite perfectly. Kinda puts me to shame, especially with all my preaching about the differences in baking at sea-level versus high-altitude, and how much harder it is to bake in higher elevations. I had been putting off making this recipe for a long time -- after seeing how the Hummingbird Bakery Cookbook's vanilla cupcakes had turned out (remember the puddles of goop? ), I didn't have the heart to see my favorite recipe in the same sorry state. But it turns out I was wrong. There was nothing to worry about after all. Is this the original Hummingbird Red Velvet Cupcake recipe or did you reduce the amount of cocoa powder and red food coloring to make it high altitude friendly? I'm a little confused because as I was reading this I was under the assumption you didn't change anything except the amount of time you beat the sugar. Your cupcakes look amazing and I also live in Denver and was looking for a red velvet that worked. Hey Jackieoh! So the recipe in this post is the exact same one from the Hummingbird Bakery Cookbook without any high-altitude adjustments. After doing several test runs, I figured that this recipe works perfectly fine in Denver -- so you're right, I didn't do anything but change the amount of time I beat the sugar. You can find the "adjusted for high-altitude" recipe here: http://hummingbirdhigh.blogspot.com/2012/03/hummingbird-bakery-red-velvet-cupcakes.html , but it's basically the same recipe as this one but with specific instructions on how much time it takes to beat the batter at each step. Let me know if that makes sense, or if you have any more questions -- I'm happy to help out! Thanks Michelle!! That makes perfect sense. I'm going to try this recipe this week! Thanks for this blog. It's strange but some of my sea level recipes work in Denver and some do not. Good to know this one works!